Libya's Long Endgame: Which Rebels Exactly Are Gaining on Gaddafi in Tripoli? The news was dramatic. After months of seeming stalemate, Libyan rebels declared they were moving in on Tripoli, the capital and stronghold of their implacable enemy Muammar Gaddafi. In recent weeks, key towns near the capital have fallen, and if the word over the past 24 hours is accurate, the enemies of the regime appear to be well on the way to encircling the Colonel's capital. But who exactly is winning the Libyan civil war? The battlefield success has been far from a smooth affair. 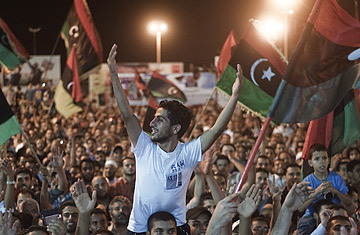 Though there is a high level of coordination between generals in the rebel capital of Benghazi and units in the east, field commanders in the western part of the oil-rich nation, where Gaddafi still controls considerable territory, are largely acting on their own, without guidance from political leaders, in what is called Free Libya. After months of disorderly fighting, military commanders in eastern Libya have finally succeeded in imposing discipline on units in the field. The rebel army has increasingly taken control of checkpoints and prevented forces from rushing forward in pell-mell, uncoordinated advances. "We have made great improvement in making sure the field units are under the responsibility of the rebel national army. The problem of the [undisciplined] brigades is over," said the rebels' military spokesman, Colonel Ahmad Bani, during a tour of the strategic oil hub of Brega after its capture by Free Libya forces. Yet despite the military's efforts, some anti-Gaddafi militias continue to operate outside the purview of the Benghazi military command. When asked about Brega's capture, a fighter outside the town listed half a dozen brigades that participated in the offensive. Many of the rogue units are Islamist militias that refuse to disband and join the rebel army. The rebels' political body, the National Transitional Council (NTC), has set up a committee to encourage harmony among its armed ranks and integrate the militias. The NTC has encountered even more problems in the west in recent months. With no direct communication with that front (which is separated from Benghazi's eastern stronghold by Sert, Gaddafi's heavily fortified hometown), the political body discovered it had very little control over field units that were slowly making their way toward Tripoli. Indeed, local troops in the west were waging campaigns independently of the NTC. "We move when we think the time is right," said Sa'adun Zuwayhli, 29, a field commander in the western city of Misratah, in June. "We don't really coordinate our movements with anyone outside Misratah." To alleviate the tension, the Benghazi council sent some troops and arms to Misratah. But the move failed to enhance cooperation between the two sides. In its latest attempt to impose discipline, the NTC sent commanders from the east to oversee operations and plan offensives in the western mountains where the rebels are making their most effective advances. "We have full coordination with all of our forces. We have command centers here and in the field," claims military spokesman Abd al-Rahman Busin. He admits that field commanders in the west still have a large degree of leeway: "No real order is given from Benghazi unless there is a big strategic move." Though rebel leaders are reluctant to admit it, some believe that the NTC's lack of control over eastern units stems in part from regional sensitivities. The council is hesitant to impose its will on western Libyans, a move that could stoke fears that easterners who were long neglected by Gaddafi want to dominate the new Libya. "All the rebel activity is in the east," explains Salah Sanussi, a political-science professor at Garyounis University in Benghazi. "The council is here. The television station is here. The foreign diplomats. Everyone. If we impress ourselves on the west, they will resent it." Sanussi concedes that if the NTC does not get all the rebel forces under its control, it may discover that units reluctant to follow its commands during the campaign to topple Gaddafi will refuse to obey its orders to disband when the war is over. "Trying to disarm the brigades after Gaddafi falls will be much harder than now. If the NTC does not move on this, it will face a large problem."